Image © [caption id="" align="alignleft" width="319" caption="Should elderly patients be left to suffer?"] [/caption] That National Health Service has come under scrutiny after it was revealed that many patients were denied basic care at several hospitals. The Patients Association Report provides conclusive evidence of elderly people being mistreated and even left in severe pain whilst in their last stages of their life. It shows shocking cases of elderly people who were left in severe pain during the last stages of their life and others who were forced to urinate in their own bed so nurses would find it easier to clean. How can one of the most developed countries health systems leave patients in pain, without food or drink and be forced to urinate or defecate in their own bed? Katherine Murphy, Patient’s Association Chief Executive, argues that this all shows a “lack of compassion and care and a shameful attitude to treatment of the elderly.” This shows a complete failure of the health system to provide care for its patients. One family member, who has spoken out about the treatment of his dying mother, claims that she was treated like a ‘slab of meat’, which left her ‘covered in bedsores and bruises.’ This type of treatment should not be taking place in Britain’s hospitals. This is a time when elderly people are most vulnerable but their vulnerability should not come at a cost. A spokesperson for the Department of Health has said that they will “root out poor performance”, but this is an issue which keeps reappearing time and time again. Last month the Care Quality Commission attacked hospitals when they witnessed ‘alarming’ levels of care and even early as February the Health Service Ombudsman raised concerns on this issue when it was reported that nearly a fifth of complaints were related to the care of the elderly. How many more elderly patients will suffer before the government resolves this issue? Why should elderly people suffer for NHS failures? 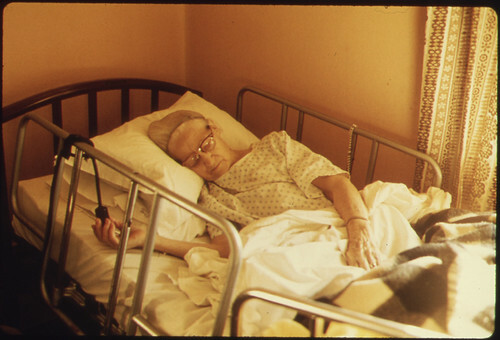 Should elderly patients be left to suffer? That National Health Service has come under scrutiny after it was revealed that many patients were denied basic care at several hospitals. The Patients Association Report provides conclusive evidence of elderly people being mistreated and even left in severe pain whilst in their last stages of their life. It shows shocking cases of elderly people who were left in severe pain during the last stages of their life and others who were forced to urinate in their own bed so nurses would find it easier to clean. How can one of the most developed countries health systems leave patients in pain, without food or drink and be forced to urinate or defecate in their own bed? Katherine Murphy, Patient’s Association Chief Executive, argues that this all shows a “lack of compassion and care and a shameful attitude to treatment of the elderly.” This shows a complete failure of the health system to provide care for its patients. One family member, who has spoken out about the treatment of his dying mother, claims that she was treated like a ‘slab of meat’, which left her ‘covered in bedsores and bruises.’ This type of treatment should not be taking place in Britain’s hospitals. This is a time when elderly people are most vulnerable but their vulnerability should not come at a cost. A spokesperson for the Department of Health has said that they will “root out poor performance”, but this is an issue which keeps reappearing time and time again. Last month the Care Quality Commission attacked hospitals when they witnessed ‘alarming’ levels of care and even early as February the Health Service Ombudsman raised concerns on this issue when it was reported that nearly a fifth of complaints were related to the care of the elderly. How many more elderly patients will suffer before the government resolves this issue?